For more than 110 years, Gongwer News Service has set the standard by providing its subscribers the most independent, comprehensive, accurate and timely coverage of issues in and around state government and politics. Produced by a staff of experienced, professional journalists, Gongwer's daily news report provides detailed coverage of every bill in the legislature, closely tracks the activities of the executive and judicial branches, and monitors ever-important state elections. Beyond daily news reporting, Gongwer provides its subscribers a package of products that allow them to plan their day and enhance their ability to react to political and policy developments. The newly-designed Gongwer website is the gateway to essential Gongwer content, and subscribers also receive email alerts, notifications and messages when actions happen, helping you make sure make sure nothing gets missed. The daily Gongwer report, which contains the day's news, features and Gongwer's in-depth stories. This ground-breaking report is the must-read publication and provides the solid, reliable information you need to do your job. The morning media clips service, with links to news and opinion from other key news outlets. Breaking news alerts: Gongwer subscribers are the first to know when major news breaks. Award-winning coverage: Gongwer has been honored with numerous awards for the quality of its reporting. Our popular bill tracking features send you a real-time e-mail whenever there's action or scheduled action on bills, keywords or issues you're following. Bill status reports allowing you to quickly determine where your tracked bills stand in the legislative process. Use the Gongwer platform to upload your own comments and produce and share professional-caliber reports. Easily share your status reports and committee schedules online with members, clients and others. Advanced Alerts: Track committees, categories and legislative activities with a single click. A one-stop shop that allows you to conveniently track and update your bills, keyword searches and status reports. House and Senate Activity reports, a compilation of all activity on bills and resolutions each legislative day. Custom committee schedules showing you the upcoming schedule only for bills you're following. The ability to receive a customized email alert when Gongwer publishes a story including keywords of your choice. This helps identify articles that reference issues, organizations or people you want to track. The Day Planner that includes the upcoming day's legislative committee meetings; agency, board and commission meetings; and other events like fundraisers, news conferences, speeches and conventions. Legislative Committee Schedules: Includes a detailed look at upcoming legislative hearings, with links to bills, committee documents and other essential information. Meetings are posted and updated immediately after official noties are released. The Agency Calendar: A listing of board, commission and agency meetings. The Event Planner: Details on all scheduled political fundraisers, news conferences, conferences and other major events. All Gongwer calendars are updated continuously online, allowing you immediate access to newly-scheduled events. Calendar Exports: All Gongwer calendars include advanced features that let you save events directly to your Outlook calendar. Correspondence Tools: Easily sort and contact legislators via email or mail. Gongwer helps you target your communications down to the level of committees and committee caucuses with just a single click. Upload your organizational logo to produce professional caliber status reports and schedules. An unmatched searchable archive to 2003. Unlike other services, when you search Gongwer's archives, you get results with individual stories, not an entire day's report that you then have to search to find the information you need. Pocket directories: Our popular tri-fold directory with the list of all House, Senate and congressional members, their party affiliation, office location and phone number. Lawmaker and public official biographies: Detailed biographical and contact information for key players in state government. Candidate biographies and election resources: Gongwer collects and publishes the biographies of all candidates for state and federal office in Ohio. Our election database also offers years of data on election results, candidates and more. Looking for other services? Contact Gongwer to see what else is available. Gongwer readers subscribe because they can trust that the information we publish is accurate, unbiased and reliable. The company's record of trust has been established over more than a century of service. Gongwer is an independent service with a staff possessing decades of reporting experience. Our staff has backgrounds in journalism, not lobbying or politics, and has sole control of all content appearing in Gongwer products. Gongwer publishes original reporting and does not copy and paste organizational news releases. Gongwer publishes each day's report when the day's news is done, so you won't have to stay up late or wait until the next morning to read our products. And Gongwer regularly emails news updates during the day, so you won't have to wait until the evening for the latest information. Subscribers are not forced to sign contracts, eliminating the risk of being locked into services that don't meet your needs. Gongwer stands by its work, and doesn't suggest in contract language that its content may not be reliable. Besides covering daily happenings in state government and politics, Gongwer also provides in-depth features and enterprise stories to expose what's happening behind the scenes. Gongwer brings you news and information that's not available from any other source. You won't pay more for add-on services because Gongwer gives you news, bill tracking, alerts, schedules, directories and much more in a single subscription package. Charles Scott Gongwer was a Mansfield, Ohio, native who had worked as a political reporter for The (Cleveland) Plain Dealer and Cleveland Press before moving to Columbus, Ohio, as a Statehouse correspondent for several newspapers. In 1906, he decided to form his own company. He saw a need for a detailed, timely, and, above all, independent account of state government activity. Mr. Gongwer responded to that need with what was then called the Gongwer Legislative Information Service. He could not have known the company that initially relied on little more than a typewriter and postage stamps would become the nation's longest-operating news service focused solely on state government and political news. 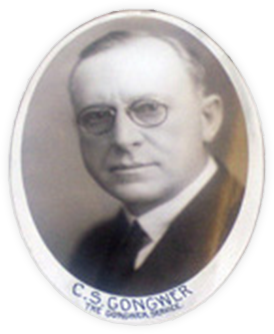 While the equipment that Mr. Gongwer used have long since been replaced by computers, websites, mobile devices and databases, what remains unchanged at Gongwer News Service is the founder's commitment to providing readers with the most comprehensive, accurate, timely, and balanced coverage available.